Máire and Seán Stafford were a touchstone of Irish language culture in this city for more than 60 years. They each had many and different talents and, when they were together, they made a formidable team. They were always together. It took him a whole three weeks after he met her to ask her to marry him. They kept Conradh na Gaeilge going for years, they kept Feis Ceoil an Iarthar going for years, they kept Féile Drámaíochta na Scoil going for years, they were the mainstay of An Taibhdhearc from 1950 for many years, their contribution to the quality of life in Galway was immense. They also reared a very talented family, many of whom were on the stage for the first time while still in their mother’s womb. They were always encouraging young talents. About 1950, they founded Club na n-Óg, a theatre school for young girls who went there after school, and they put on little plays in the Áras in Dominick Street. Most of these were written by the Staffords and Máire used to write Irish language lyrics and put them to well known arias for the children to sing. Fr Mac Giobún from the Jes used to accompany them on the piano. Once a year, they would go on an outing. This little school was very popular and ran for several years, but they eventually had to give it up because they could not get enough help. 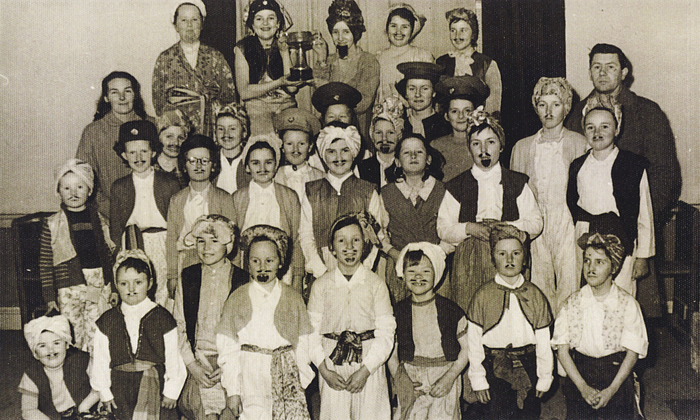 Our photograph is of one of their productions from the fifties. Those we have been able to name (through their disguises ) are, at the back: Bríd Roe; Marie Hartigan; Frances Mitchell; Mary Gill; and Freda O’Toole. Third row: Máire Stafford; Patricia Morahan; Gabrielle Moynihan; Helen Lawless; Rosaleen Carroll; Anne Stewart; Mary Lawless; Lourda Brannelly; --- Wynne; Terri Spelman; and Seán Stafford. Among those in the second row are: Máirín O’Sullivan; Mary Cunningham; -- O’Sullivan; Helen O’Donovan; Miriam Nestor; and Margaret Shevlin. Included in the front row are Maelíosa Stafford; -- Ní Charra; --- Ní Charra; Kay Mitchell; Ruairí Stafford; Anne Coyne; and Nuala Keane. If you were to write a CV for Máire Stafford, you could describe her as an actor on stage, film, or television, a director, a playwright, a costume designer, a superb embroiderer, a translator, a make-up artist, a lyricist, a visual artist, an author of pantomimes, and you would be right on all counts. Seán and herself were hugely influential in the lives of countless Galwegians. They were nominated as Galway People of the Year and they were conferred with honorary degrees by UCG. Sadly, after 64 years of married life with Seán, Máire passed away last July. It is fitting that An Taibhdhearc is organising an all-star commemorative evening tomorrow in honour of Máire. It will include extracts from some of the plays she starred in, extracts from some of the operas she translated, some songs and some dances which will feature costumes she designed. It promises to be a memorable evening in memory of an extraordinary natural talent. On Monday next, March 9, the Galway Archaeological and Historical Society is hosting a lecture in the Harbour Hotel at 8pm. The title is ‘Galway and the Gaeltacht Commission, 1925/26’ and it will be given by Professor Gearóid Ó Tuathaigh. All are welcome. On Tuesday next, March 10, the Western Archaeological and Historical Society is hosting a lecture by Tim Collins in Cawley’s Lounge in Craughwell at 8pm. The title is ‘Galway’s Hero of Confederate Texas’ and again, all are welcome.